Mid to high end TVs or projectors now use Ultra HD (UHD) resolution, with many also supporting High Dymanic Range (HDR). 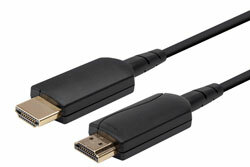 To support these new features the HDMI cable needs to trasmit a higher data rate of up to 18Gbps. We only offer the best HDMI cables that meet the HDMI 2.0 18Gbps certification to guarantee you will achieve the best picture quality possible.